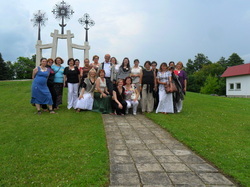 The thrid project meeting took place between 04. and 06.07.2011 in Sakiai, Lithuania__. 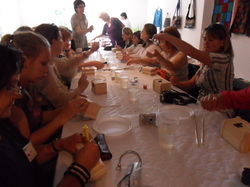 The aim of the project meeting was to visit different organizations offering creative workshops, talk to female self-entrepreneurs about their business set-up as well as to exchange about various handracft techniques which are practiced in the region. _The project partners as well as the learners of each partner organization visited the Labour Exchange office in Sakiai, where Mrs. Rasa Masteikiene explaned the situation of the unemployed women in the Sakiai region. The biggest group of unemployed women is the one living in rural areas and without formal education.